We are fans of the Pinkalicious series of books. Pinkalicious is fancy and loves pink, her parents are fun but they’re not shy about enforcing the rules, and Pinkalicious learns a valuable lesson about eating healthy, green foods. What’s not to love? 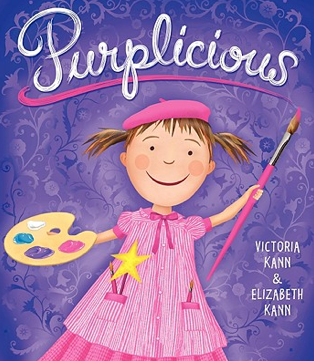 For Christmas, we chose to share the pink fun with my niece and the kids’ younger cousin by giving her the first three books in the series: Pinkalicious, Purplicious and Goldilicious. Since there were three books and I have three kids, I asked them each to make an inscription in one of the books to make the gift a little more special. Lila picked Goldilicious because she likes “unackorns”. Colin’s summary of Pinkalicious addressed the perils of eating too many cupcakes because he’s all about making good food choices. This story will teach you that you don’t have to agree with other people. Just be yourself. Love, Caleb. P.S. So far in each grade I’ve had to teach people about diabetes. 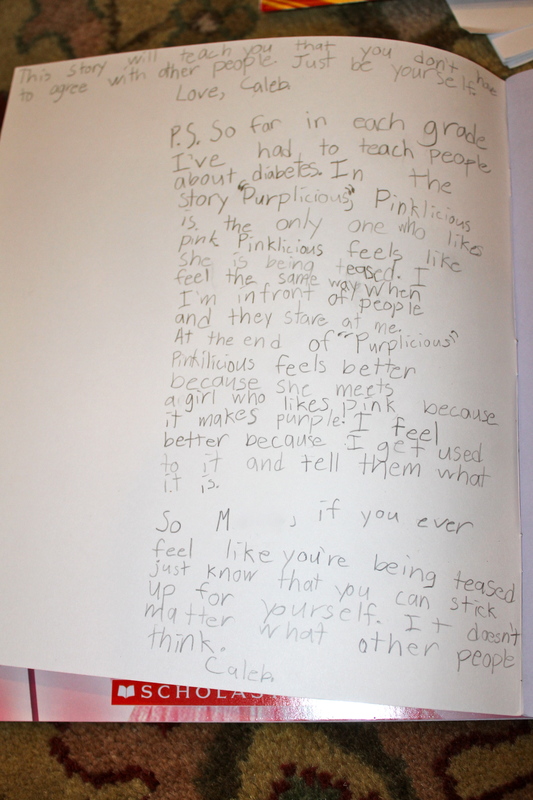 In the story “Purplicious”, Pinklicious is the only one who likes pink. Pinklicious feels like she is being teased. I feel the same way when I’m in front of people and they stare at me. At the end of “Purplicious” Pinkilicious feels better because she meets a girl who likes pink because it makes purple. I feel better because I get used to it and tell them what it is. So M, if you ever feel like you’re being teased just know that you can stick up for yourself. It doesn’t matter what other people think. Caleb. No matter how much I try to normalize his environment, and despite the best efforts of the caring people who surround him, this feeling of being different remains. As heart-wrenching as it is to read his words, I take comfort in the wisdom that he has gained, and his willingness to share it with those he loves. 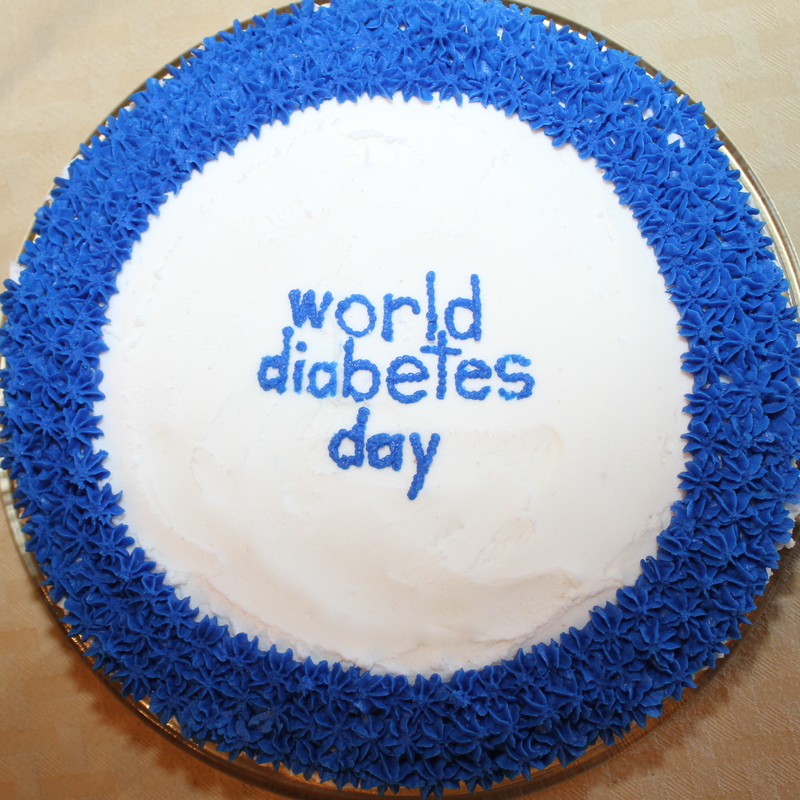 We had two World Diabetes Days. 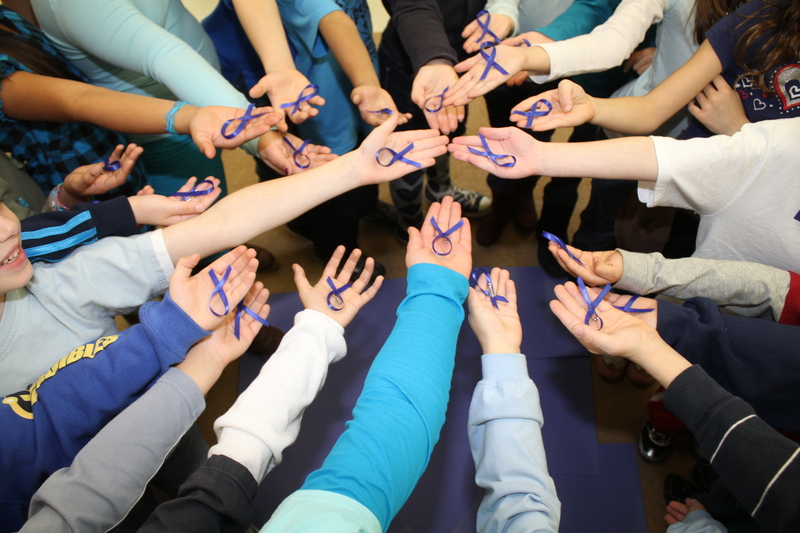 Our 2nd Annual School Blue-nity event was on Friday. There was an even bigger swarm of blue this year since not only was Caleb’s school involved, but also the “big school” next door. 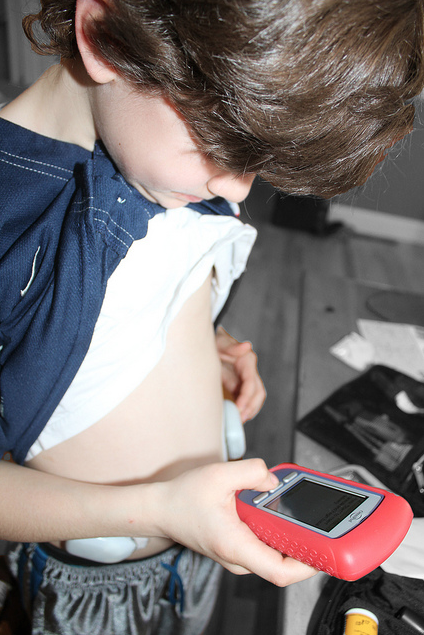 There are three children among the two schools of approximately 800 students living with type 1 diabetes. It was great to broaden the scope and include all three of them this year. 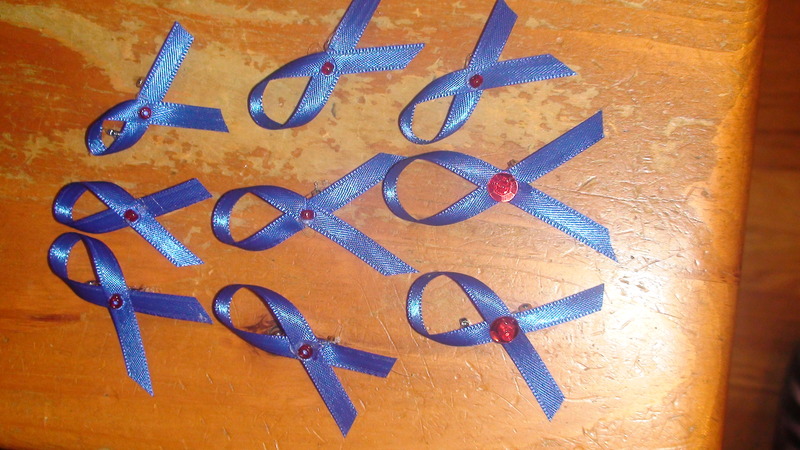 I made ribbons: special ones with a red sequin for the three children of honor, ones with a small red bead for those people (family, school nurses, teachers) that support them most, and plain ones for all their classmates and extras for whomever wanted one. The red sequins and beads represent the drop of blood needed to check their blood sugar. I was able to meet one of the other two diabetic children for the first time on our school spirit day. I told him I liked his pin. I was happy to hear him proudly reply, “Thanks. Mine is special.” I told him I knew – I had made it especially for him. Our awareness video was shown during each of the eight lunch sessions. I went back and forth between schools to watch the kids’ reactions. The younger kids were all “oohs and ahhs” at the beautiful blue monuments. The older kids ate quietly and watched. The principal did a great job of asking questions of the kids to reinforce the things they learned from the video. I was happy to hear them answer the questions correctly. 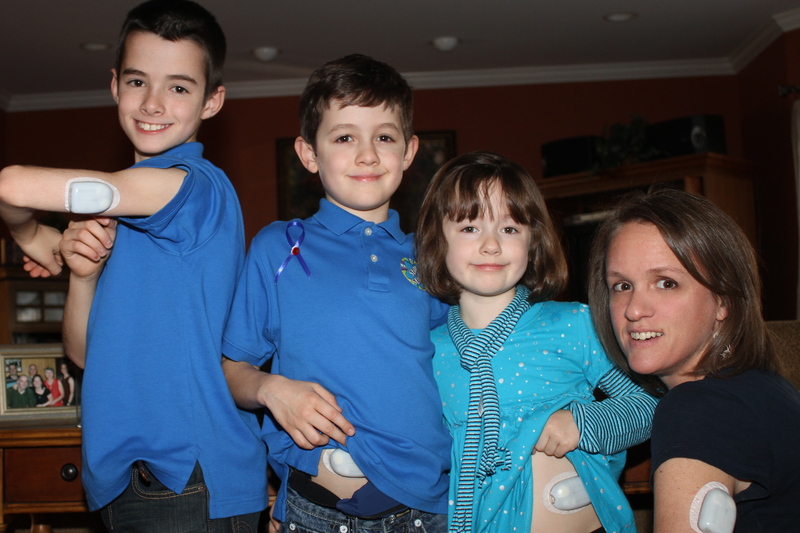 Colin, Lila and I each wore an OmniPod (from our failed stash accumulated over time) in support of Caleb (I still have mine on and I am amazed at how I’ve completely forgotten about it). Caleb even added an extra one on his arm so that people could see it. Colin and I both got a lot of questions about it and we were able to explain what it was and get conversation going. 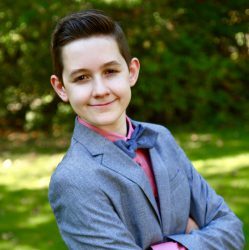 Colin said that one of his classmates began explaining to others what it was once he learned. I thought that was just great! 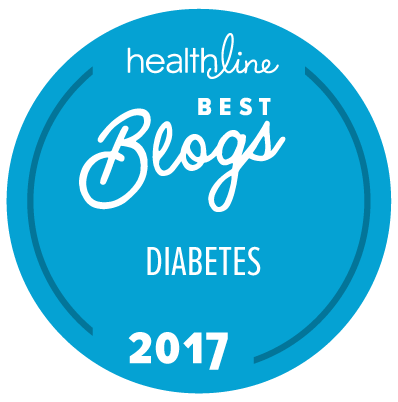 I don’t expect that anyone walked away with a comprehensive knowledge of what diabetes is, but I do believe that an overall message was sent, even to the younger kids – people who live with diabetes are just like everyone else and should be treated as such. 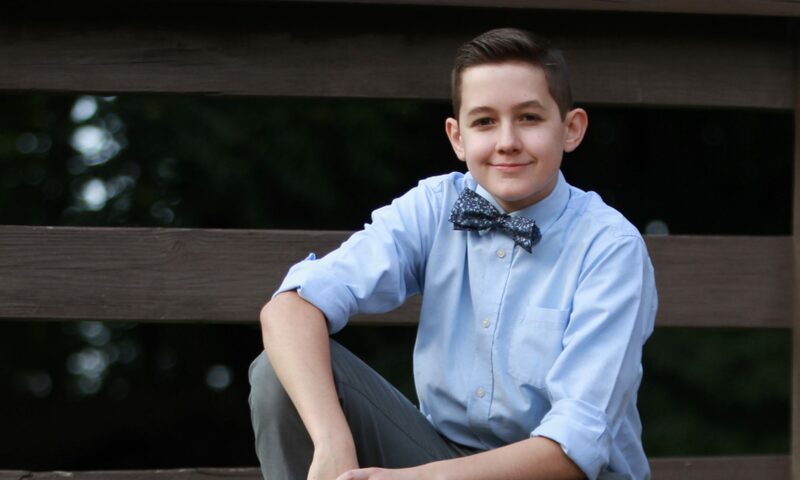 For Caleb, at his age, that’s what I want his peers to know. 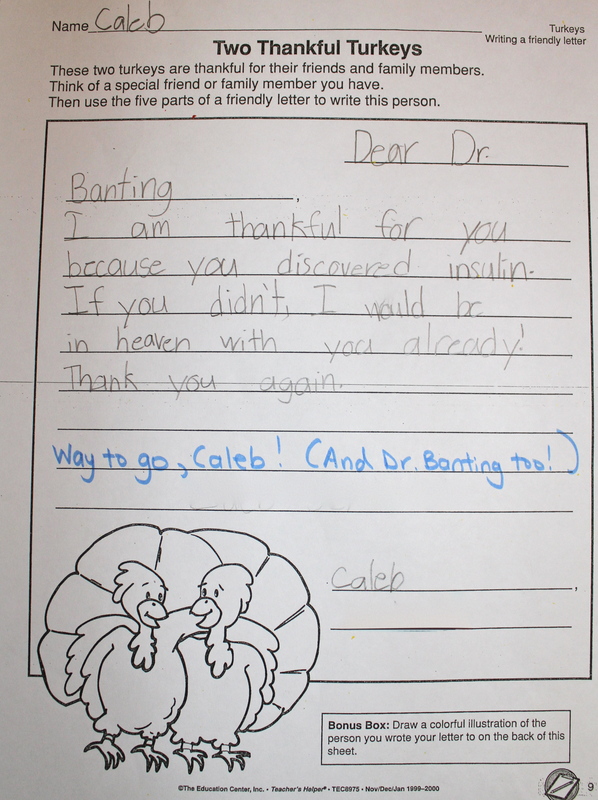 Perhaps the highlight of the day was what Caleb’s teacher did for him. Not only did she allow me to gather the kids to take a great picture of unity of their outstretched hands with arms sleeved in blue, she helped put all those little pins on each student. Best of all, she sent Caleb out of class under false pretenses so she could do something extra special for him. 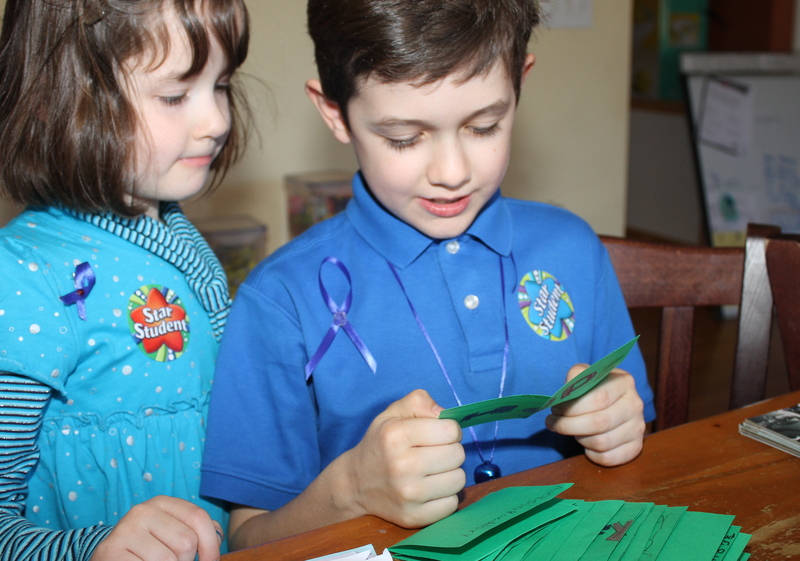 She had each student write a note on green paper (his favorite color) telling him what they like about him. They surprised him with them when he returned. There was one from each student, his teacher and his school nurse. The kids had such lovely words of support for Caleb. I think his favorite comment – which was on almost every note – was that “he is funny”. On November 14th, we made a cake for Dr. Banting’s birthday and I let Caleb dictate the rest of the day. He took many, many pictures. 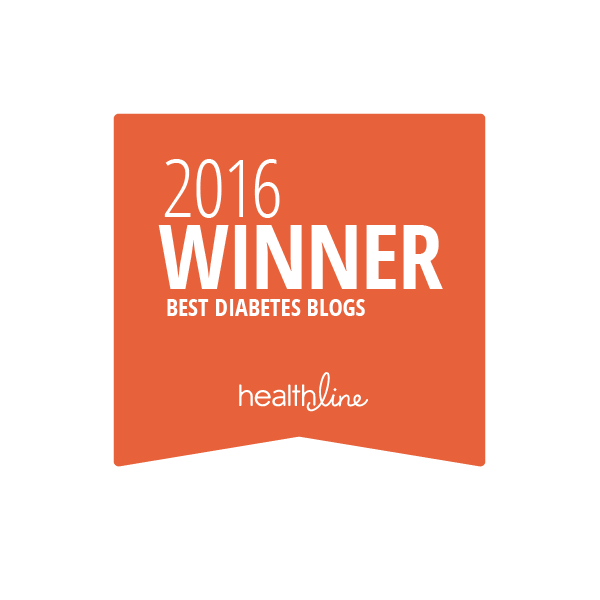 He showed us videos he accumulated on his camera including footage from last year’s walk and last year’s World Diabetes Day. He set up Olympics (it was more like just playing outside, but we went with it). He even made every diabetes management decision himself. He decided when to check his sugar, what action to take for each reading, he made his lunch and bolused for it, etc. I just sat in the background and said “Mmm-hmm. Okay. What do you think you should do?” I think it was harder for me to restrain myself than for him to actually take all the actions. And we did the Big Blue Test – all of us. 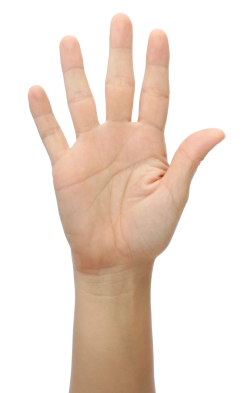 Lila’s reading was originally “HI”. Ahem. Okay. Please wash your hands and we’ll try again. She came back with a 113. My original reading after activity was 57. Alrighty. Checked again and I was 115. Gotta love the meter accuracy. We ended the day with lots of blue glow in honor of the many monuments lit up around the world. 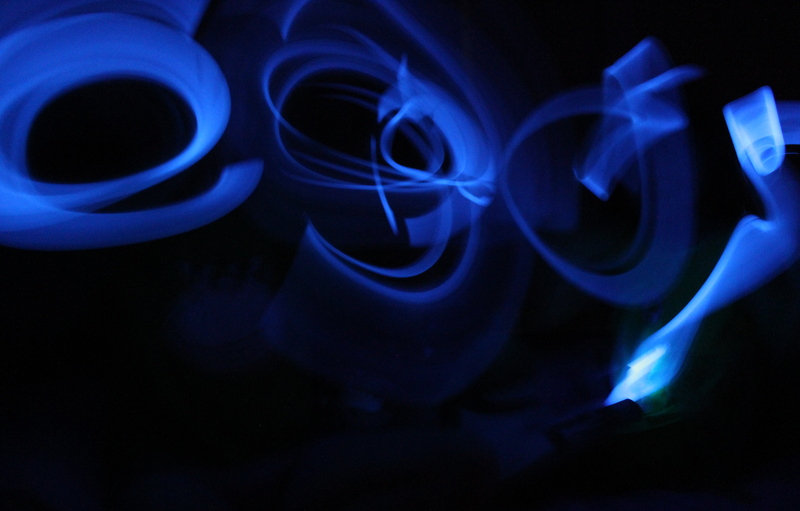 It was a lot of fun creating the swirl pictures in our attempt to make blue rings. Overall, I think we had a great acknowledgement of the day, and of Caleb. 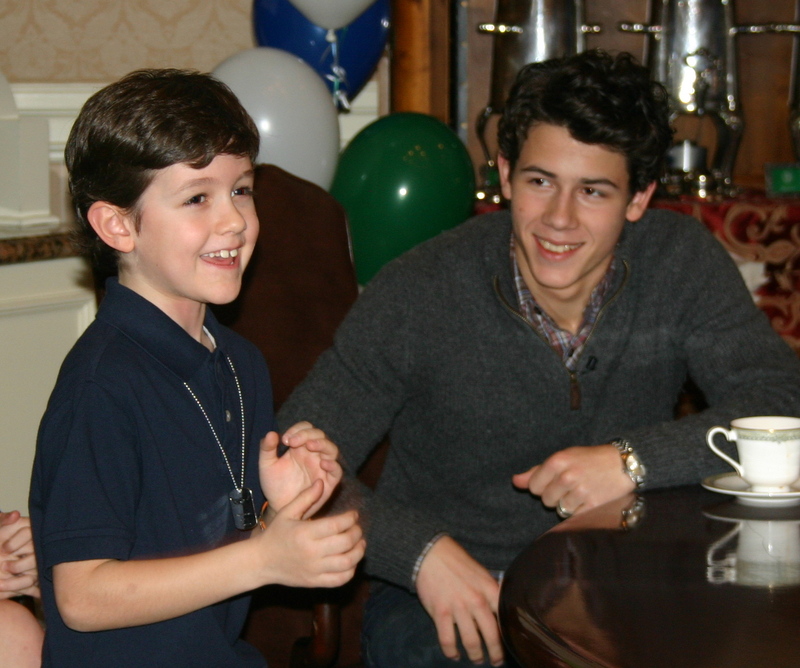 He was happy through it all, and that’s what I’ll remember.